I've said it a thousand times before, but I'll say it again...I love weekend breakfasts. During the week there is never enough time to put together a nice big breakfast, but when the weekend comes along, I'm all over it! I was blessed enough to receive a great big box of goodies from Greenwillow Grains recently. Rolled oats, pastry flour, bread flour, bran, and many more delightful grains. I could not wait to get in the kitchen and bake with them! The last couple of weeks have been awfully busy with school coming to an end and all the events that go along with it, so I haven't had as much kitchen time as I would like. But no worries, I plan to develop many different recipes with the Greenwillow Grains products I received and will be sharing each and every one of them with you! So far I've made these delicious pancakes as well as oatmeal cookies. The cookie recipe was graciously provided by Greenwillow inside my box of goodies. (And yes, I will be sharing those soon!!) I have to admit, I love the products I've used so far and am really looking forward to developing more recipes with the Greenwillow Grains and Flours. And no, that was not a paid advertisement. It came from the heart! Just a quick background on Greenwillow Grains...they produce 100% organic products; they are sustainable and make compostable packaging (and have the cutest gingham flour bags EVA! ); everything is made locally, grown and milled and Oregon; and they are directly helping their communities in a number of ways. Check out their website or their Facebook page to learn more. So back to my new recipe...I made these amazing whole wheat banana pancakes last weekend. 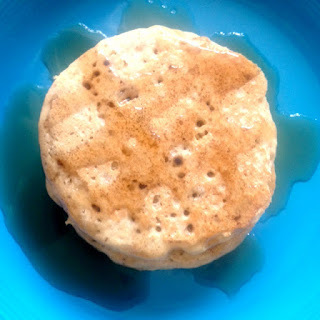 I'm a pancake freak and love adding new ingredients and testing things out all the time. These were definitely a hit with the entire family. Make them soon for your family and let me know what you think! In a large bowl whisk together the flour, sugar, baking powder and salt. In a medium bowl, whisk together the egg, milk, oil and vanilla. Add the mashed banana to the wet ingredients and mix well. Add wet mixture to the dry ingredients and mix until moistened. The batter may be a little lumpy and that's fine. For standard size pancakes, pour about 1/4 cup of the batter onto a hot buttered griddle or large skillet. Cook over medium heat until the pancakes start to bubble and the edges are starting to brown, about two minutes. Flip and cook on the other side for another minute or two, until golden brown. To keep the pancakes warm while the rest are cooking, I put them on a plate in a warm oven, usually set at 200 degrees. Once they are all cooked, serve with butter and syrup, if desired. *Disclaimer: Greenwillow Grains was gracious enough to send me their products for recipe development at no charge, but I was not monetarily compensated for this review. All opinions, as always, are my own.